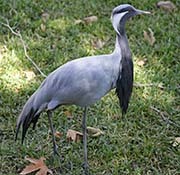 The Demoiselle Crane is the smallest and second most abundant crane. They are found in Asia, Turkey, India, and Africa. 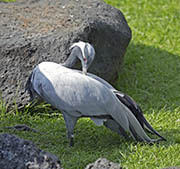 The sexes are similar but the male is slightly larger. 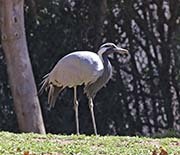 The body is mostly light gray with a black head and foreneck, black-tipped secondaries, and a white tuft extending from behind the eye to the upper nape. 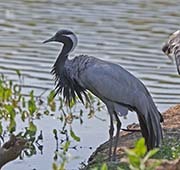 The black neck stripe feathers are longer and drape down over the breast. The iris is red, the legs and feet are gray. Juveniles are similar but duller. Diet: Diet is mostly seeds (especially from grasses), insects, worms, lizards and other small invertebrates. They also feed in cultivated fields especially while migrating. 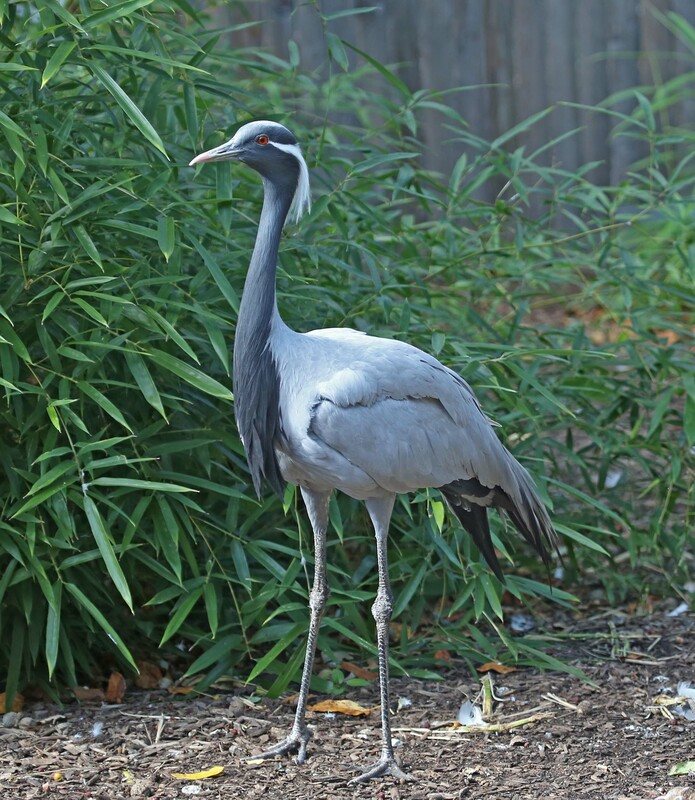 Courtship: Cranes have a display that involves dancing, bowing, running, jumping and stick tossing. This display is believed to be part of the courtship ritual and may also reinforce the pair bond. Younger birds also 'dance' and the reasons for this may be to help with motor development and to relieve aggression and tension. Nesting: Nests are usually built on the ground in patchy vegetation. The male's role is to defend the nest. 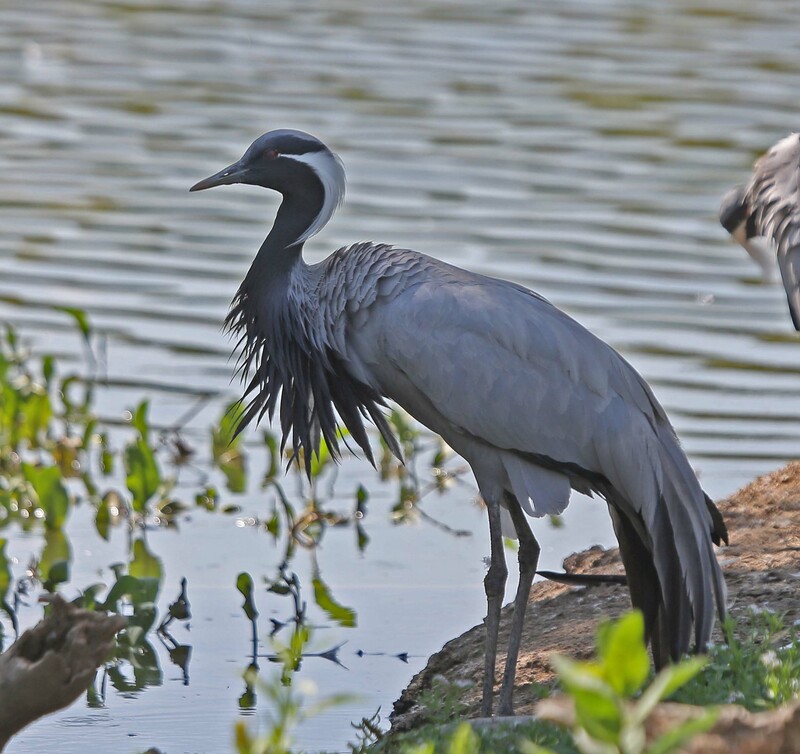 Habitat and Range: Demoiselle Cranes are found in a variety of habitats including wetlands, open grasslands, cultivated fields usually close to a stream or lake. 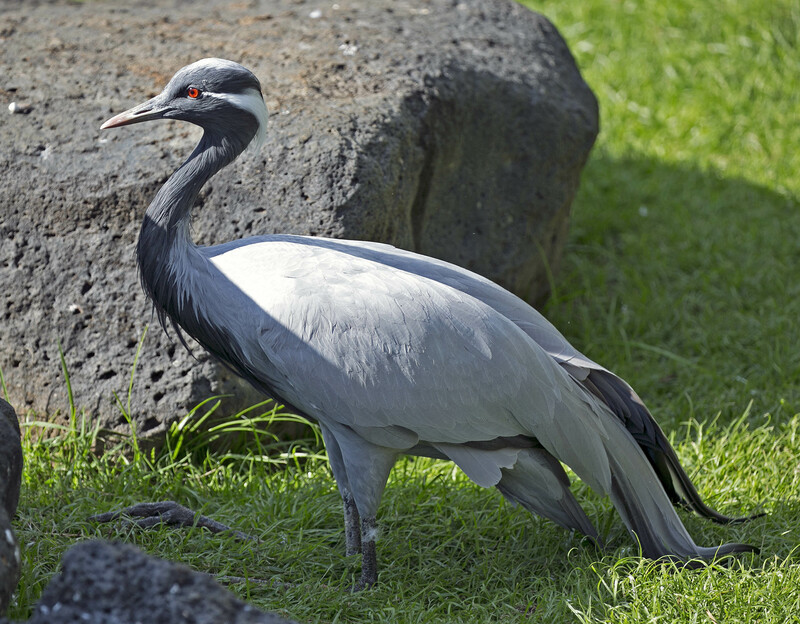 The breeding grounds of Demoiselle Cranes are found from the Black Sea east to China. They winter in African and India. The Black Sea and North African population are declining and the Turkey population is almost extinct. 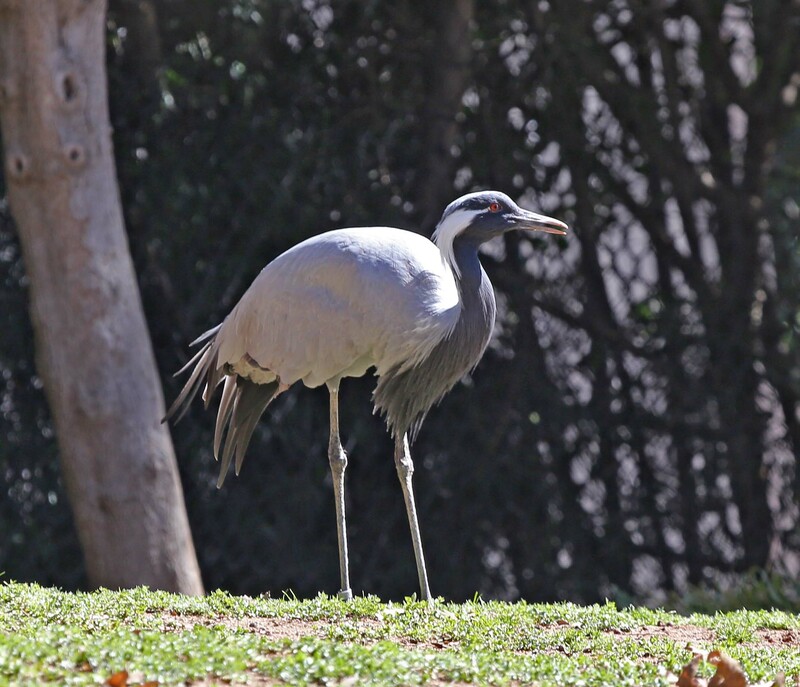 Vocalization: Mated Demoiselle cranes take part in unison calling where the male and female assume a posture where their head is thrown back and beak skyward and alternately call. Migration: Where Demoiselle Cranes migrate depend on their breeding grounds. 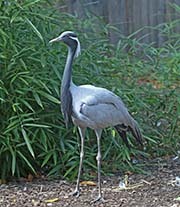 The largest population of Demoiselle Cranes breed in Mongolia and northeast China. They migrate across the Himalayan Mountains to India reaching altitudes of 16,000-26,000 feet. The declining Black Sea population migrates to Africa. The Turkey population may not migrate. Tongue/feet: Grey legs and feet.